Cover photo:: Petronas Twin Towers (Malay: Menara Petronas, or Menara BerkembarPetronas), twin skyscrapers in Kuala Lumpur, Malaysia. Keywords: Traditional Built Environment; Traditional Art Evolution Process; Traditional Quality; Case-Based Reasoning Information Analysis; Rural Development. 3nd lacking in post-development conditions. The incompatibility of the planning practice with traditional qualities is partly rooted in its analysis and design (planning) methods; and it seems important to devise an alternative method which can reflect processes which shape those qualities. This study, after making a review on prevailing methods of information analysis within planning processes, argues why those methods are blind to traditional quality, or are unable to wade through an appropriate intervention there. Subsequently, by introducing fundamentals of case-based reasoning models, this study suggests that a study on and evaluation of previous experiences, within that model, is capable of simulating traditional art evolution processes; and justify its adoptability in modern planning. In conclusion, this study proposes how and where these models may be applied within the planning bureaus for retrofitting these models for adoption within traditional environments. Keywords: Urban Design Urban Form; City ; Energy; Sustainability. Cities are the main leak of Country. The process of urbanization denounces the need to transform settlement from a weak point to the strength of the future sustainability. Urban shape is deeply related to the availability of the energy sources in the territory, comparing city’s behaviour to a living organism dependents on the energy flow into and out. This one-to-one relationship between form and energy sources emphasizes mutations engender each other on their develop and decline. According to scientific studies, relevant “physical” factors affect directly settlement’s energy behavior and its microclimate. The ability of each city to work simultaneously on local and global objectives has driven Europe to indicate them as a crux and urban design as the appropriate tool for defining the shape compatible with sustainability goals. The use of this tool becomes prerogative to bear on urban form and reach the condition of self-sustainable energy’s island. Due to present global economic crisis, many people in cities had to lose their jobs or went for early retirement. Thus, productive self-sufficient areas were designed as agro-recreational sites. Integration of the city with its countryside is undertaken as important issue in the formation of urban agro-recreational areas/activities in Gaziantep city. Such urban-rural areas/activities have growing recreational significance for inhabitants of Gaziantep. This made important contribution to local production of fruit and vegetables, reveals present-day leisure pattern of Gaziantep urban agro-recreational activities. The growing demand for such urban-rural activities has recently created business with special focus on agriculture, livestock breeding and local agro-tourism. Therefore, a concept is growing where families, in highly urbanized areas, can experience rural life in first hand, providing leisure activities and support their living with an innovating concept, where urban parks and city fringe areas can be the engines of a self sufficient urban environment. Keywords: Accessibility; Visually Impaired Passengers; Light Rail Transit (LRT) Station. Ensuring access to the built environment and public transportation is a crucial element in reducing the mobility constraints of people with disabilities. This study intends to investigate the accessibility of visual impaired passengers regards to interior design of Kelana Jaya Line LRT station. The access audit was evaluated at core area, transition area and peripheral area of selected LRT stations by using site observation and interview research method. A standard checklist was taken in accordance to the Malaysia Standards Code of Practice for Access of Disabled People to Public Buildings (MS1184:2002).The result shows that, although most of the stations accommodate access for disabled people however the design of facilities provided was not fully incorporate with standard requirement and user-friendly. These lead barriers to independent living for persons with disability. As a conclusion, aside from providing a complete of public access facilities, comprehension of social sensitivity and capability to plan for continuity and uniformity should be taken into consideration to eliminate the architectural barriers in the built environment in the future. Keywords: Space Syntax; Economics; Accessibility; Urban Design; Spatial Configuration; Street Pricing. This research is an effort to understand the theoretical foundations of how the configuration of space is interrelated with the economic properties that sustain the built fabric. The argument is based on unfolding accessibility in two perspectives: As a spatial parameter that understands urban form as a system of relational patterns of connections that organises human activity. And as an economic parameter that can be valued under specific price mechanisms of urban properties. The paper shows a first preliminary study of testing street prices with spatial accessibility measures. The method was to use current house prices with Space Syntax techniques, a spatial analysis tool that outputs measures of connectivity and accessibility represented in a street network. Overall, economy contributes on the shape of our cities that prevail in the spatial relations of the built form, resulting in new configurational economies. Kuala Lumpur Waterfront: A Public Place for All? As one of the efforts to improve the quality of living environment in the city centre, revitalisation of the Kuala Lumpur waterfront was announced as one of the nine Entry Point Projects in the Economic Transformation Programme. This is an opportunity to revive the public place that used to be a trading post. When the function of the river changes from being the life line for the city to the city’s backyard, the use of this waterfront space was affected. 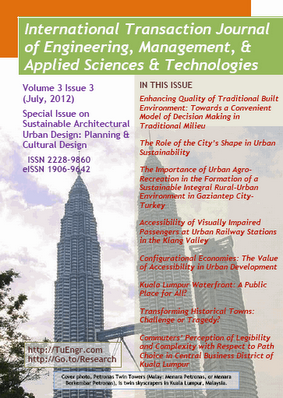 This paper aims to examine the user’s perception on the accessibility of the Kuala Lumpur waterfront. Using the qualitative approach, the focus group technique was employed. The findings suggested that poor access to the waterfront has affected the use of the waterfront. The research inferred the importance to consider public access at the waterfront by future decision makers in reviving this priceless public place for all. Transforming Historical Towns: Challenge or Tragedy? The historical centers of many towns in the world are under constant pressure of new demands caused by the development of post-industrial civilization. The risks of this process, which can either completely re-structure the existing towns or change them into little more than tourist zones will be shown on the example of Prague. The situation of Prague is a typical example of a historical town where the political, social and economic interests are clustered in a way which makes it extremely difficult to achieve rational solutions to the city problems. The possibilities of future progress should be tested on the level of urban planning, legislation and critical theory of culture. Such an analysis should include the social aspects of possible changes, which have immediate consequences especially for low-income groups of society. The sustainable development in this context means to avoid or at least to minimize any irreversible changes in the inherited land- and cityscapes. The effect of environmental factors on walking behavior needs to be considered based on the purpose of walking trip; whether walking for transport or walking for recreational purposes. Since everybody walks on his/her daily transport, studying walking behavior of those who walk for transport would contribute to maintain the minimum rate of physical activity. Commuters are the major group of those who walk for transport. It was found that the path choice of pedestrians can be considered to examine the effects of environmental factors on walking behavior. Introducing two environmental factors of perceived legibility and perceived complexity, it is demonstrated that the theoretical and empirical relationship between these factors and walking behavior as well as the path choice criteria, leads to define these two factors in accordance with commuter’s specifications. Accordingly, both perceived legibility and perceived complexity are two important path choice criteria of commuters in CBD of Kuala Lumpur.